Boyds, Md. 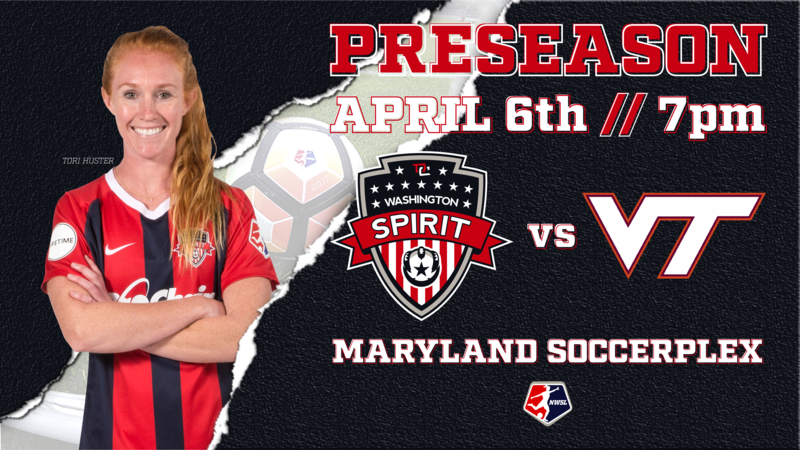 (April 5, 2019) – The Washington Spirit will host the Virginia Tech Hokies in its final preseason match at the Maryland SoccerPlex before the start of the 2019 NWSL season. The first three preseason matches have seen results in the win, loss, and draw column for the Spirit. After shutting out James Madison University 5-0 in the preseason opener, the Spirit’s second match saw them take a 1-0 halftime lead before conceding three goals in the second half and falling 3-1 to French side Girondins de Bordeaux. Their most recent game against the University of North Carolina concluded in a 0-0 draw. With just one match remaining before the beginning of the 2019 NWSL campaign, Spirit Head Coach Richie Burke has taken many positives from his players’ performances on match days as well as on the training ground leading up to the beginning of the season, without undermining the importance of these preseason matches. “We just had a team meeting with them right now to give them kudos for taking on-board this re-direct and taking on-board this different philosophy of playing and retaining the ball. We had six sequences of 18-plus passes, which is great for them to see and look at,” said Burke. Virginia Tech finished their 2018 season with a 5-5 record in ACC play and an overall record of 11-8-3. After qualifying for the NCAA tournament, the Hokies advanced to the third round after defeating Texas and Arkansas, where they were eliminated by eventual runners-up and ACC rival North Carolina. Saturday’s preseason finale will be broadcasted on YouTube via YouTube Livestream for free on the official Washington Spirit YouTube channel. Kickoff is scheduled for 7 p.m. ET, with gates opening at 6 p.m. EST and the livestream to begin airing prior to kickoff. The 2019 NWSL regular season will begin for the Spirit at home on April 13 against Sky Blue FC at the Maryland SoccerPlex.